2005; 383 pages. Book 1 of the "Nursery Crime" Series. Genre : Comic Fiction, Ffordian Slip. Overall Rating : B.
Humpty Dumpty had a great fall, and isn't going to be put back together again. But was it an accident, suicide, or murder most fowl? Detective Jack Spratt and his partner, Mary Mary (who is a bit contrary) investigate Hump's death, while at the same time fending off a hostile takeover by a vainglorious colleague and trying to keep the Nursery Crime Division from being a victim of budget cuts. There's the usual amount of Fforde's zaniness, puns, complexity, wit, clever character names, and plot twists. TBOE is a bit more plot-driven than the Thursday Next series (face it, we care more about what happens to the plot of Jane Eyre than we do about what happens to Thursday's husband). The ending of TBOE is great. As expected, a whole slew of nursery rhymes are touched upon. But there are still some literary references (most notably to Shakespeare's Richard III), and also a nod or two to Grrek mythology (the titan Prometheus and Jack's daughter Pandora become enamored with each other). 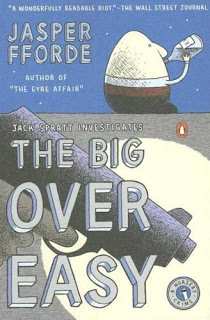 The Big Over Easy is actually a re-write of one of Fforde's earlier, unpublished stories. It's original title was Who Killed Humpty Dumpty? TBOE and The Well of Lost Plots are interconnected. A half-dozen characters appear in both books, and IIRC, the Nursery Crime world is invented by Thursday in TWoLP. Fforde even back-writes some references to Thursday Next into TBOE. I give this book a "B" only because I doubt it will supersede the Thursday Next series as your favorite work(s) by Fforde. If anyone else had written this, I'd probably be giving it an "A". 01.) How many words are there in Chapter 13 of The Big Over Easy? 02.) How many rejections did The Eyre Affair receive before someone finally picked it up? 03.) Does that web link for "extras" found in all Jasper Fforde books really work? 02. 76. See the Wikipedia article on Jasper Fforde. 03. Yes indeed, and it's packed with lots of resouces. The link for BPOE is www.nurserycrime.co.uk/special/js1.html and the password (forgive me, Jasper) is "Vaughn". I tried to skim this a bit because I haven't read it yet, but I"m glad to know this one is good, too. Jasper Fforde makes me smile. no problem re skimming. i deliberately included almost nothing about the (main) storyline itself, except that Humpty Dumpty falls. Yeah I noticed that. Poor Humpty. I'm afraid I'd miss Thursday. no problem with missing Thursday. The Nursery Crime series is planned to be a trilogy only. Fforde plans to write at least 10 books, so that means at least seven Thursday Next novels. Five have been published already; so he has at least two more to go. He's also writing Shades of Grey, which I don't think is related to either of the series. I'm not sure if it's a new series or standalone. he's also getting behind on his schedule. after The Eyre Affair was published, he planned to write one book per year for ten years. and he did this for the first seven years. but he didn't put anything out in 2008, and nothing yet this year. is he getting burnt out? tired of Thursday Next and Jack Spratt? i've ssen other authors, most notably Robert Asprin and his "Myth" series, run into that. I think a lot of authors face burn out. Writers tend to spend a lot of time with characters, from the moment of inception to way after production, especially if its a series. That time period can be years and if the author/character relationship interferes with real life, then trouble can arise. Some of the problem is, the author/character relationship is usually one-sided, with the author having little or no control over the character. Several times, the author has tried to strike back (killing off the main character or others), but this rarely works as it creates an uproar and potential enemies in fans. Perhaps in this situation, a separation from the characters is advised to let the author rest and regroup to restart fresh, but the public and people in charge don't like to wait. I don't know what can help this situation, except to have a mass of writings for serial characters before they make it big. BTW, I look forward to reading this one.